The best 20 minutes of my week were spent pointing ten red lacquered toenails toward the sky, then tossing my feet behind me and pulling that sturdy swing back to start the pendulum again. Two tiny blonde monsters pumped their little legs next to me and for a few minutes all was right with the world. I spend a couple days a week with those two grubby little monsters. They are delightful cherubs at least half of the time. Like those 20 minutes we spent stretching our legs to the clouds and making up songs with a chorus of “Sarah is a funny girl with a creepy laugh!” That line is courtesy of the quick-witted, snarky five-year-old. The other half of the time they are total jerks. There is a reason I call them little monster and littlest monster. These girls test my ability to censor my swear words. I find myself terrified of the little dictator who punishes with silence and the wild animal who punishes with screams. How did it escalate this quickly? How is it the five-year-old wants to give logic and reason for why she knocked her sister down, but my logic and reason are of no use to her? And then a new activity presents itself and, like the jolt out of a nightmare, we are all friends again—sharing crayons and glue and laughter. What just happened here? The moments when the monsters are being absolute terrors, I smile, because I have no plans to have children. But I don’t change my mind in the sweet moments when we are making up songs together and the five-year-old is helping her little sister find her shoes. I don’t suddenly want to parent my own precious baby when I snuggle a perfect, sleeping newborn. I might. I reserve the right to change my mind about all my decisions. But I’m pretty sure I won’t. I’ve been having this same conversation for years. It is assumed that every woman everywhere wants a husband and kids. It is even treated as a tenant of faith in certain church circles. Then every once in a while I meet a woman who also doesn’t want kids. She will scrunch up her nose and shake her head and say, “No way would I ever want children.” The word comes out with so much disdain you’d think it was a swear word. I laugh and nod along, but I know I don’t belong in that camp either. I adore kids—I am a part-time nanny for goodness sake. But nobody ever asks me why I don’t want children. There are a dozen answers. The first one is wrapped up in the way I was raised. I was raised by a strong woman who was told by others who she could be. She could be a wife. She could be a mom. And I’m not convinced she wanted to be either of those things, but she did it. That was what society and her religious organization required of her. As a little girl I thought I would grow up to be a wife and a mom, because that is all I ever saw. It even made sense to me—my maternal instincts kicked in way back in elementary school when I would share my lunch with kids who forgot theirs and I would care for my young nieces after school. But I would also pretend to be a ninja and a scientist and build forts with my brothers. I thought I would grow up and get married and have kids because that is what girls do, but I did not see my femininity as exclusively wrapped up in the roles my own mom found herself bound to. Yes, I am a very maternal person, but that doesn’t mean I need to be a parent. I have a habit of being the “mom” in the group. In high school I helped my friends with homework, took their keys away when they were partying and cheered them on in their sports. In college I brought snacks on group hikes and was the standing designated driver (helps to have a friend who doesn’t drink anyway). I volunteered in children’s classrooms and at the retirement home. I am always looking out for someone. Always. But I also have the freedom to help all of these people. I had the time when my flight attendant friend, Sarah, needed an overnight nanny for her boys. I have the time now for two little blonde monsters in the morning two days a week. I had the time to help my nephew learn to ride his bike and give rides to a coworker when her car broke down. I have time to be a caregiver in a thousand different ways. You see, I like to be the stage crew for the parents and caretakers who are the full-time actors. Every mom has said at one time that they need a third arm. And every once in a while, I’m there to help. That is a gift I can offer because my arms are both available. As young girls I think we are encouraged to dream about a romantic future of prince charmings and gorgeous babies. And so many of us find that in our own way, but I suspect there are a whole lot of women like me—women with big dreams that stretch way past the picket fence with the attractive husband and the two and a half kids and the dog. I no longer feel bound by a societal norm that doesn’t fit my life. I realized that I love being around to step into the hard spaces and fill for the tired mamas. I like to hand my sunglasses over to distract a three-year-old so her mom can tell me about her book and her big dreams. I like to hold the handlebars on a nine-year-old’s bike to help him practice while his mama makes dinner. I like to be on standby for all the people who might just need another arm today. 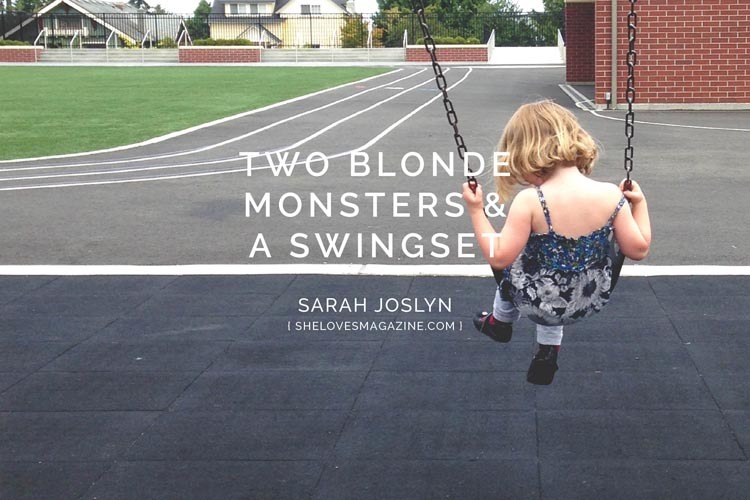 For right now I have two blonde monsters and a swingset.